Barbara Seidman, Vice President for Academic Affairs/Dean of Faculty and Professor of English, reading The Scarlet Letter, by Nathaniel Hawthorne. 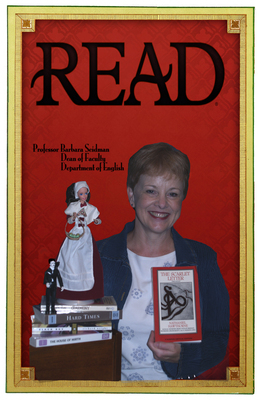 Terry, Paula and Nicholson Library Staff, "Barbara Seidman READ Poster" (2007). READ Poster Gallery. Image. Submission 18.